Conspiracy theorists just love to spend their time debating outlandish notions of what really happened during historical events. Simple, verifiable truth isn’t enough. 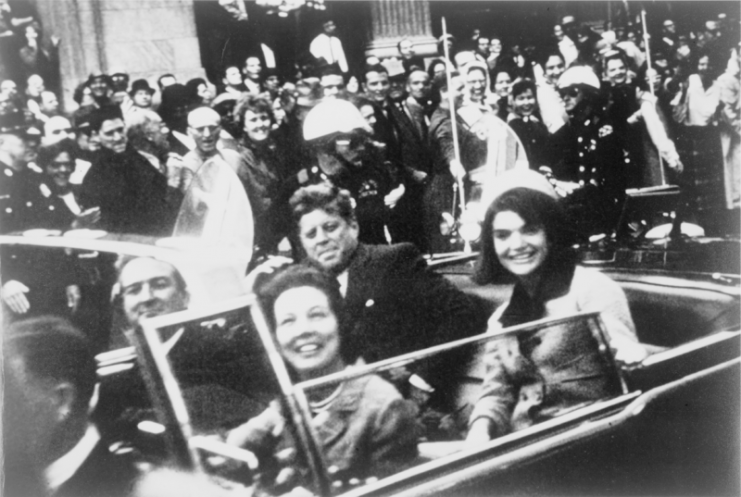 Marilyn Monroe was killed by the Kennedys to stop her talking about her love affair with JFK; Kennedy himself was assassinated by the Cubans, or the Mafia, or some other suspect group who had a nefarious motive for killing the U.S. president. When there are few people around to witness and corroborate such events, they become ripe for embellishment or even downright fabrication. There may be no greater example of how conspiracy theorists rework and gnaw on a subject than the demise of Adolf Hitler at the end of World War II. Because the Americans and British didn’t actually see his body (it was burned beyond recognition after his suicide), there was a vacuum which could be filled up with wild tales and conjecture. The Soviets found his remains in Berlin and took them back to Moscow, but they assured the world that yes, Adolf Hitler was dead. But sometimes, the simple truth is just too suspicious for folks of a certain mindset. 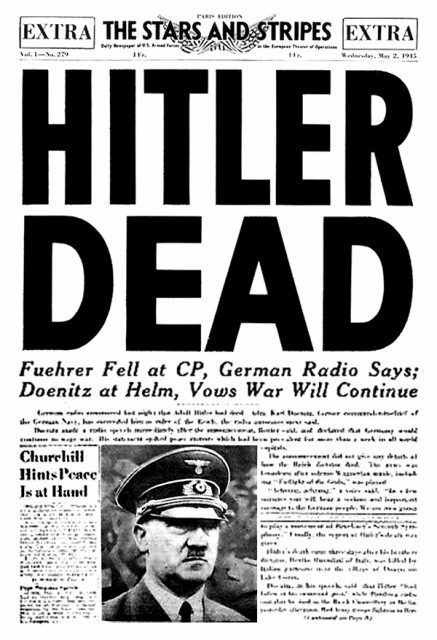 Front page of the U.S. Armed Forces newspaper, Stars and Stripes, May 2, 1945. 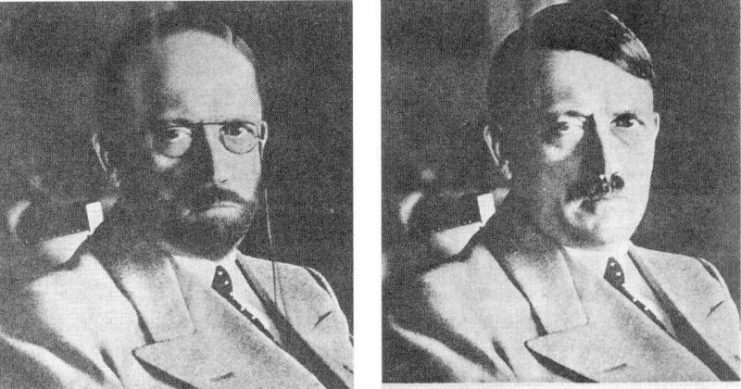 Hitler depicted by the U.S. Secret Service in 1944 to show how he might disguise himself to evade capture. Now, in a new program available on Amazon, entitled Adolph Hitler’s Great Escape, a so-called expert on the matter, Harry Cooper, explains that he’s been tracking the possibility of Hitler’s escape for about 30 years. Cooper claims that newly released U.S. covert documents demonstrate that the Allies took the possibility very seriously, at least at first. That idea is fair enough, considering they didn’t see an actual body or even dental remains to prove that Hitler was dead. But there is no proof whatsoever, other than Cooper’s, that Hitler did indeed get out of Berlin, with or without the help of Nazi officers. This, he insists, left a “gap” in those waters, creating a “superhighway” through which Hitler, Eva Braun, and even their dog escaped. 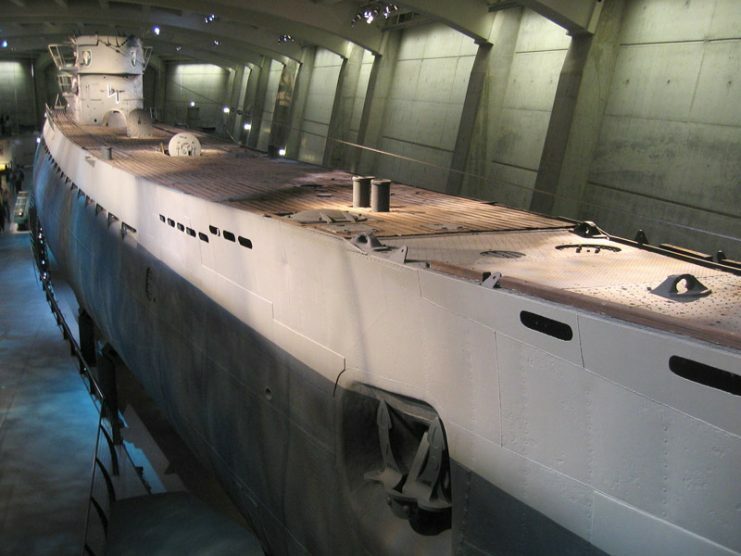 They first caught a flight to Spain, then hopped aboard a German U-Boat and made their way to Argentina. If the entire notion of Hitler and Braun living out their lives quietly in Argentina sounds absurd, that’s because it is. Cooper says he has “confirmed” these findings, but he doesn’t mention how. 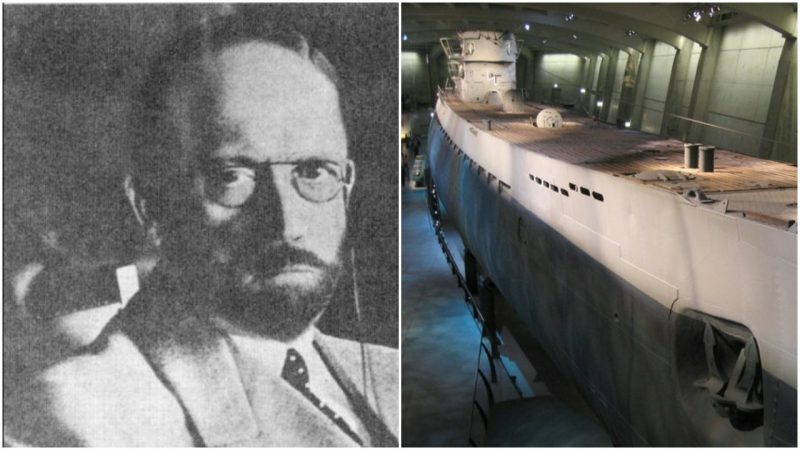 He claims that after their flight to Spain, Hitler and Braun took the U-Boat to San Antonio Oeste, and were helped by sympathetic locals to live under aliases for the next 30 years. The entire episode was code-named “Operation Mercator,” a name Hitler devised when he asked officers to come up with a way to get him out of Germany. Cooper has studied this possibility for about 30 years and has written several books on the subject. 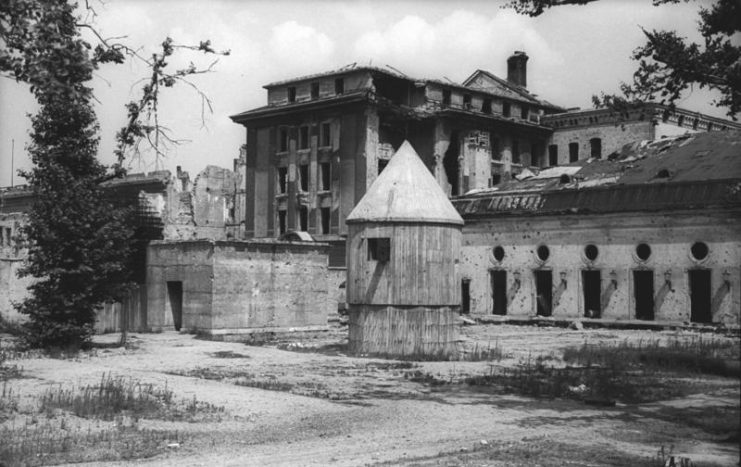 But the fact remains that, after the war, the Allies sought — and received — assurance from the Soviets that Hitler was dead. To ponder otherwise is an exercise in futility. 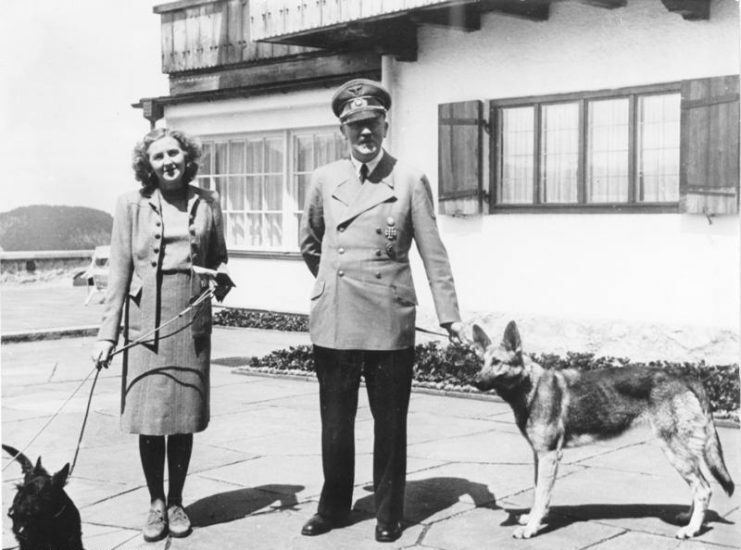 Even if Hitler and his mistress had miraculously managed to escape, they would have died long ago. One has to wonder why Harry Cooper has made such a documentary and written a series of books on the matter when the subject is old and moot.